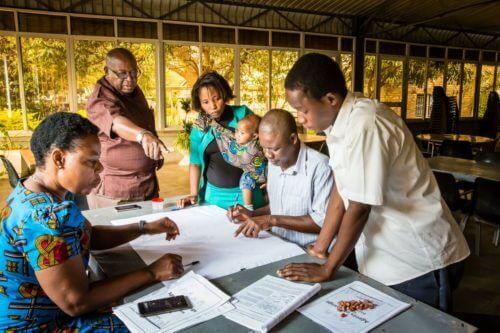 Participants map local community assets for building resilience to disasters. Anglicans from dioceses throughout the Caribbean are currently (Monday 11th to Friday 15th March 2019) participating in a “Pastors and Disasters” workshop in Grenada. The gathering is being hosted by the Province of the West Indies and facilitated by a team from the Province along with the Anglican Alliance, Episcopal Relief & Development and The Primate’s World Relief and Development Fund. Churches and communities around the Anglican Communion are increasingly facing the devastating impacts of climate change. Exposed island communities are particularly vulnerable and extreme weather events such as hurricanes, cyclones, sea surges and flooding, as well as rising sea levels, are becoming the “new normal”. Churches are frequently at the forefront of responding to disasters and can also play a key role in building resilience to them. Participants from the Dioceses of Jamaica, Trinidad and Tobago, the Windward Islands, the Virgin Islands, Guyana, the North Eastern Caribbean and Aruba are gathered at St Martin’s Retreat Centre, Grenada for the five-day training. 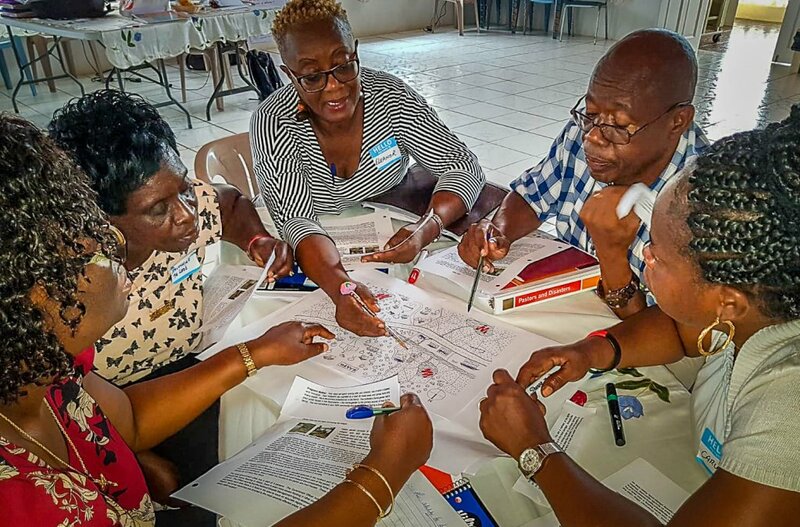 Together, they have been sharing their own experiences of disaster preparedness and resilience, learning best practice using the Pastors and Disasters toolkit and looking at how to adapt it to the Caribbean context. Pastors and Disasters is a resource for community-based disaster risk reduction and management created by Episcopal Relief & Development in collaboration with other Anglican agencies. It distils knowledge and experience gathered from across the Anglican Communion and provides tried and tested practical tools for churches to respond effectively. Reflecting on the workshop, the Anglican Alliance’s Caribbean Facilitator Clifton Nedd said, “I am delighted that the workshop has come together. The Church has been considering how it can expand and deepen its role in disaster risk reduction. These tools will add tremendous value to other ongoing efforts: ultimately, the people of the region will benefit”. Tina Beazer, the Long Term Recovery Director of The Episcopal Diocese of the Virgin Islands, said, “I have enjoyed that the workshop has been so practical. I love that it is a process and you can follow the process. I have gained knowledge and confidence from using the Pastors and Disasters tools. When I go back, I plan to discuss with the Bishop and start putting it into practice. In fact, I plan to give a copy to the Governor of the Virgin Islands, who I know personally”. Carvel George from the local parish of St Andrew’s in Grenada said, “The best thing about the workshop for me was that we gained lots of knowledge, but it was also practical. I enjoyed that we had different tutors sharing their experience. After the workshop I will give the toolkit to the representative for the district so that he can gain the knowledge that I got from the workshop. For the church as a whole, I will share with them, but also to people individually. I will also share with the school, as it would be a useful tool for the teachers and the students. Young and old have knowledge of all around and will need to deal with a situation when it occurs”. Claudette Marshall from the Diocese of Jamaica said, “I particularly liked our field visit yesterday to use the Pastors & Disasters tools. It got to the heart of the matter. It gave us practical experience of the reality of using the tools”. She continued, “Thinking about our context, with a huge expanse with three suffragan bishops, we will need to break the work up and work in each of the regions. I have already spoken to the HR officer. We have a diocesan disaster plan, which is sent out to parishes each year. But ahead of the workshop we agreed that it would not be sent out until I got back. We will look at it and review the plan”. Dr Janice Proud, the Anglican Alliance’s Disaster Response and Resilience Manager, said, “It is exciting to have such an enthusiastic group from across the Caribbean coming together to learn how to plan and prepare for disasters. We greatly appreciate the support of the bishops in the region for their wise selection of people to come and learn how to support the dioceses develop a preparedness plan. Participants have greatly appreciated both the focus of the toolkit on the role of the church and the participatory learning style that allows for adaptation to the local context. “In all parts of the Anglican Communion the Anglican Alliance and partners are shifting the focus to support building resilience at all levels – diocesan, parish and individual. In this way the churches, communities and individuals can look to decrease their vulnerabilities and increase their capacity using their assets,” she said. The workshop was funded by the Archbishop of Canterbury’s Anglican Communion Fund with additional support from PWRDF and Episcopal Relief & Development. The workshop facilitators were: Fr Clive Thomas from the Diocese of Barbados, who leads on disaster preparedness and response on the Anglican Alliance Caribbean forum; Clifton Nedd, the Anglican Alliance’s Caribbean Facilitator; Nagulan Nesiah, Episcopal Relief & Development’s Senior Programme Officer for Disaster Response and Risk Reduction; Naba Gurung, the Humanitarian Response Coordinator of The Primate’s World Relief and Development Fund (PWRDF); and Dr Janice Proud, the Anglican Alliance’s Disaster Response and Resilience Manager.